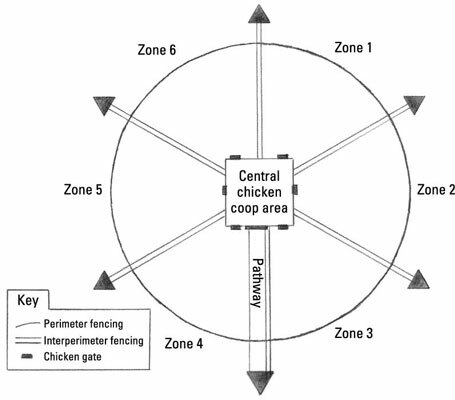 This basic, hypothetical, confined-range chicken concept consists of multiple separate foraging runs or zones for a chicken flock. This concept can be used in an urban, suburban, or a rural setting. The figure shows six separate runs or zones. The number of zones can vary depending on your property, landscape design, and overall layout. All runs or zones are connected to a central chicken coop and secure outside pen, accessed by small chicken gates. Opening and closing these chicken gates allows management of which run to forage chickens in. Chickens have access throughout the day to their feed bucket, waterer, and nesting boxes from their runs. Ranging chickens return to their secure chicken coop to roost, and are locked up in their chicken coop for protection each night. All chicken gates are closed for the night. After creating these permanent runs or zones, you simply rotate your flock to these different foraging areas. Having the ability to rotate these runs or zones gives you a lot of flexibility. You can rotate your flock when one run or zone is grazed to a level you desire. You might use one run or zone in a particular season only. How long you keep your flock in each run or zone depends on many variables. You want to confine-range your chickens so that a run or zone is not over grazed. This depends on what is planted in each run or zone and the size of your chicken flock. This multiple run or zone concept allows your chickens to be rotated regularly, which lets each foraging area replenish itself with plant growth. These foraging areas can be defined by many names like outside runs, zones, garden rooms, enclosures, sectors, paddocks, pastures, or whatever you want to call them. These rotating runs ideally provide food for your chickens to forage on, landscape to shelter them, shade from the sun and camouflage to hide them from the keen eyesight of predators. From these rotating runs, chickens must have access to their nesting boxes, feed, and water. It’s highly unlikely that your chicken flock can forage for all their caloric energy needs solely by ranging in theses foraging runs or zones. Your flock, however, will eat far less feed when ranging, which saves on your feed bill. Chickens benefit by having access to both a balanced laying feed, and foraging for their natural diet. In this ideal scenario, each run or zone can be planted with a mixture of plants for all seasons, or you can have a run landscaped specifically for each season. This rotating run concept can help you understand how to rotate and manage your chicken flock effectively in your garden. Overforaging with your chickens leads to a barren run, and doesn’t allow a run to naturally replenish itself with new growth. In other words, each run needs vacant time for green growth to replenish itself. Usually, it takes at least three-weeks time for a foraging area to replenish itself. Many variables affect how long a foraging area can be used before chickens are rotated to another run. Check out the table for some insight as to how many chickens will fit your space. Incorporate some technique for predator control, whether it’s fencing, landscaping, a trusted guard dog, or another option.